What is now simply referred to as “The Long War”, the conflicts in Iraq and Afghanistan—previously called Operation Iraqi Freedom and Operation Enduring Freedom—have tested America’s resolve, have stretched America’s forces, and now comprise America’s longest combat engagement. So too, have Individual Augments, Service Members both active and reserve called to TDY orders, necessarily filled critical billets downrange, valiantly conducting missions which otherwise were staffed by organic troops before the Long War waged on. The following story details exposing the risks involved with being a so called, IA, fighting an enemy as insidiously dangerous as he is overtly threatening, the detainee. Beyond simply identifying a high-risk group of warriors, the authors offer Navy leadership a population-based, public health solution of boots-on-the-ground surveillance, intervention, and education. 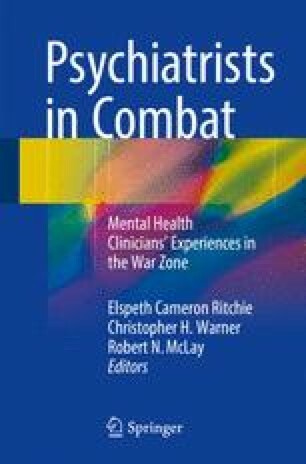 The author would like to acknowledge the contribution of his “right hand man,” battle buddy, and collaborator, Justin Campbell, Ph.D., in the preparation of the manuscript.